Caffeine remains one of the world’s most sought-after pick-me-ups, with ~85% of Americans consuming caffeine daily. Regardless of whether caffeine is naturally occuring or synthetically produced, consumed hot or cold, the effect is the same. 400 mg: The amount of caffeine associated with moderate consumption and considered safe for healthy adults to consume in one day. Pregnant and nursing women are generally advised to reduce their caffeine consumption and should always speak to their medical doctor to determine what is right for them. 200 mg: The amount of caffeine that is considered safe for acute consumption (single serve) in healthy adults. In 2017, The International Life Sciences Institute of North America (ILSI) recently conducted a systematic review which once again confirmed longstanding caffeine intake recommendations from global health authorities such as the US FDA, Health Canada, and the European Food Safety Authority. When consuming caffeine it is important to take all sources of caffeine into account. Moderate consumption of up to 400 mg/day of caffeine is considered safe. Average intakes of caffeine among adults, range from 110 mg (females ages 19 to 30 years) up to 260 mg (males ages 51 to 70 years) per day — substantially less than 400 mg per day amount. Daily intakes of caffeine exceed 400 mg per day for only a small percent of the adult population. Caffeine sources for adults are largely from coffee and tea, which provide about 70 to 90 percent of total caffeine intake across all adult age groups. Most mainstream energy drinks contain about half the caffeine of a similar-sized cup of coffeehouse coffee you'd find at the corner coffee shop. All Red Bull products voluntarily declare the total amount of caffeine per container on the label, along with an advisory statement that the product is not recommended for children, pregnant or nursing women, and persons sensitive to caffeine. 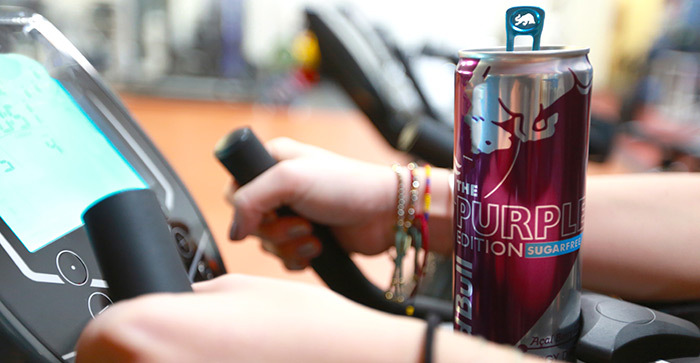 To learn more about energy drinks and their ingredients, get the facts here. 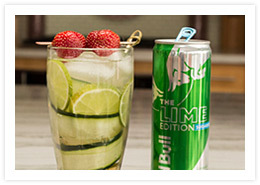 Try this non-alcoholic mocktail, featuring Red Bull’s Lime Edition Sugarfree.